I will admit to being a bit of a closet technology nerd, particularly when it comes to automation. One of my task since returning to the farm has been getting us involved in “precision farming.” This technology has been exploding in the last several years and can really do some amazing things. The technology is already out there right now to steer your tractor across the field automatically (auto-steer) and vary the rate of whatever you are planting or applying, with accuracy in the sub-inch range, all you have to do is set the speed of the tractor! We started out last year by putting a yield monitor in our combine. This makes maps of our fields using a GPS that show exactly what sort of yields we are getting in each area of the field. 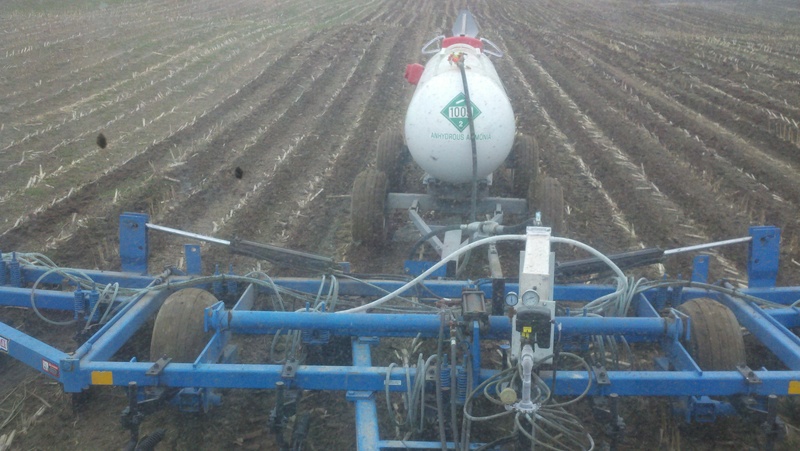 This year we hooked that system up to our anhydrous ammonia applicator and it will be going on the sprayer as well. 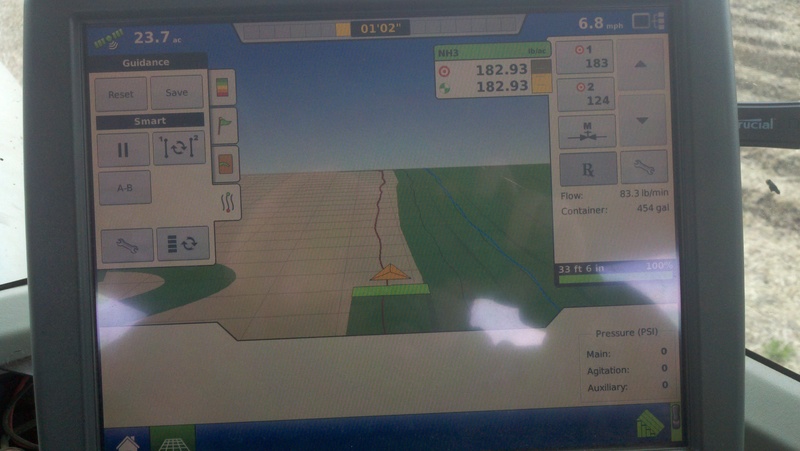 Using some software I can take our yield and soil maps and make “prescriptions” for individual fields. Lower yielding parts of the field aren’t going to need as much nutrients, so the application rate can be backed off saving us input costs and reducing nutrient run off. Once that prescription is loaded into the system, I can drive across the field at any speed and direction, and the GPS tells the system when to increase or decrease the rate as speed or application rates change. It also shuts off if you drive into an area that you have all ready applied. Before we had this system for anhydrous, you had to look at a chart on the applicator, calculate how fast you thought you were going, your applicator width and your desired rate of application, open a valve to the recommended setting and then try to drive as close as possible to speed that you had chosen and hope you were applying your desired rate, but you had no real way of knowing exactly how much you were putting on. The different shades of blue represent the prescription for this field, lighter blue being a lower rate. The green is where I have applied, and how much was applied. Along the top of the screen, it tells me: Acres covered in this field, a light bar telling me how much to the left or right I am in relation to the last pass to not leave a gap or overlap and my current speed. We don’t currently have the auto-steer equipment, someday we will have it and then the tractor will automatically keep itself on the perfect line. The box with the green heading that says “NH3” tells me the target rate for this field (this changes in different parts of the field if I have a prescription loaded), the actual rate being applied and the yellow bar is an estimate of the current tank level. The box on the right of the screen gives me different target rates that I can manually select if I don’t have a prescription. The up and down arrows allow me to manually bump the rate up and down. Px loads a prescription. It also tells me the flow rate, and another estimate of the tank level. (it is kind of cut off) There is a bit of a glare over a green bar along the bottom, above that it says “100%” and “33 ft 6 in.” This is telling me how much of my applicator is currently “on” since for anhydrous we only have one section, it is either all “on” or all “off”, for spraying and other applications we will have multiple sections. The box on the left contains some guidance information, and different tabs that allow me to display different information and edit how the information is displayed. 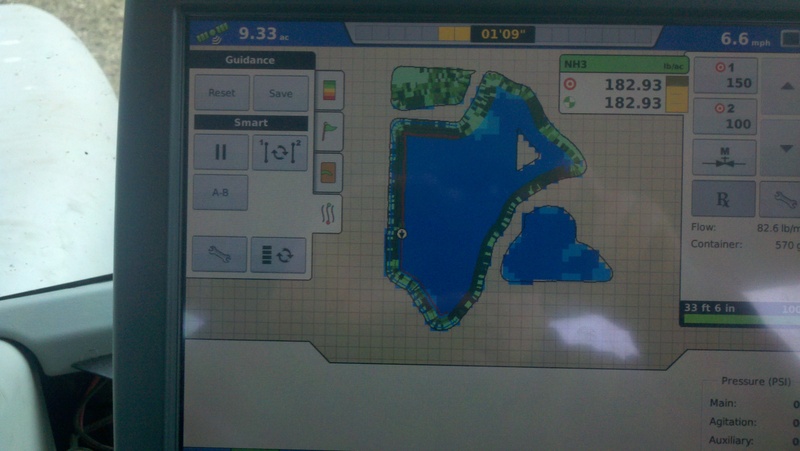 I can also show it like this (this is the screen I view most of the time) it shows the tractor as an arrow and the implement as the green rectangle behind it. Basically if you keep the point of the arrow on the line you should have no overlaps and no gaps! Here is another screen I check from time to time. 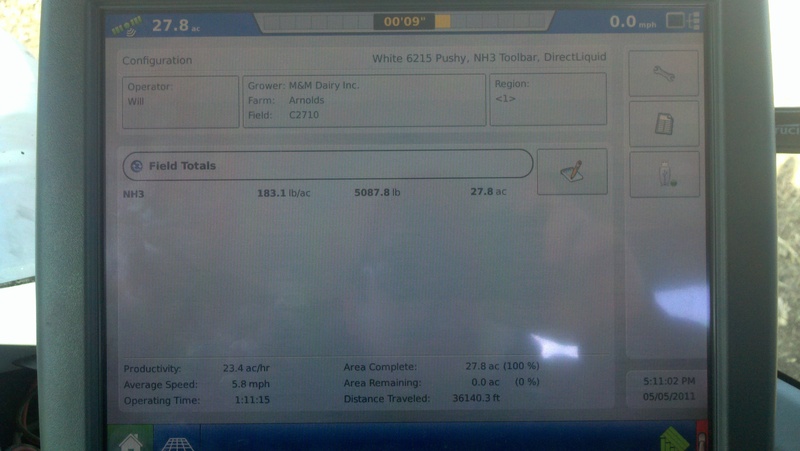 I would check this screen as it shows me how many acres I have remaining in this field and how much product I have used. Using this, I can quickly estimate if I am going to need another tank delivered to this field, or if I have enough to finish. Sorry for the picture quality, bouncing around the cab and trying to get glare free pictures is hard! This entry was posted in Agronomy, Machinery. Bookmark the permalink. So has D.T.’s head exploded yet?? Cool stuff. your famous with this one!!! So does a fully automated system with auto steer require there to be a human occupant in the tractor? Well, some companies are working on having the tractor be able to pick the implement up and turn itself around at the end of the field. I think they probably can all ready. So theoretically you probably wouldn’t need a person. :p Most of the systems that i know of still require you to turn the tractor around at the end of the field. Farmers are kind of becoming like airline pilots i guess…only needed at the start and end, or if something goes wrong!